I wrote some days ago about Rooibos and was surprised that there are so few commercial beers with Rooibos. Another thing that I have been thinking about brewing is Sorghum beer. I will write a couple of articles about sorghum beer and this one is about the Umqombothi version. You can find recipes regarding Umqombothi in books and on the internet. As always when it comes to traditional “cooking” nothing is exact and there are as many recipes as there are brewers. I will examine one that I found in Justin Bonellos´s book Cooked in Africa. I will also give you my version of this traditional beer later on. 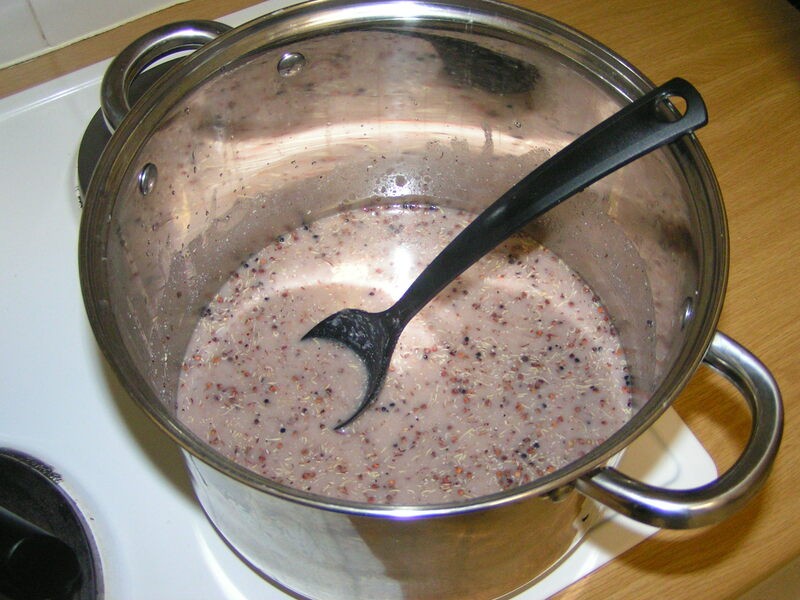 Mix 1 kg of Maize meal with 1 litre of cold water. Add 1 litre of boiling water and leave to cool. * Cold water from the tap is between 10-15 degrees C and when mixed 50-50 with boiling water you would get a temperature around 65 degrees. More or less a saccharification rest. This will get some fermentable sugars in the mash of you use Sorghum malt. When it reach room temperature ad 2 kg of Sorghum corn and leave to rest over night. * Room temperature is between 20-30 degrees depending on season and this gives us a phytase (acid) rest for the sorghum. The ph level will come down a bit. “Leave to rest over night” will start a spontaneous fermentation. A lower ph will also help the fermentation. The next day half the mash should be mixed with 3 litres of boiling water. Get it to boil and then simmer for 30 minutes. Pour into a large basin. Repeat this process with the next half and then combine the two mixtures and leave to rest. * The fermentation will now stop when boiling. The slow and long cooling process together with “just letting it simmer” will give the beer some DMS flavors. * Yet again we will have a phytase (acid) rest for the sorghum giving a light sour taste to the beer. The fermentation will also start again. The mixture should be filtered through a metal strainer before serving. The end product is a thick, lightly sour beverage with yeasty and DMS notes. The alcohol should be around 2-3 %. This is a good Umqombothi brewed in an old traditional way. Later on I will make my version of this traditional beer. This is quite a process. Thanks for this. Il def try this. There is a website http://www.urban-e.co.za. They supply a ready prepared sorghum mix. You literally add a packet to cold water in a tap drum and have beer in 24 hours. I made some a few days ago and was pleasantly surprised. It had a nice fizz, slightly sour, as a result of the pressure in the tap drum it looked like I was pouring a draft. It actually made a small head which decipitated quickly. It had a lager like taste. 4 cups later I was cruising. It tends to take my appetite away hence suspect high nutrition.